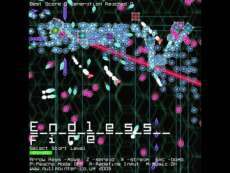 Fight an infinite army of generated enemy ships. Enemy attack patterns evolve over time becoming more complex and aggressive. Each enemy destroyed with Z-fire releases green multiplier cells (multiplier descreases over time). Each enemy destroyed with X-fire releases yellow score stars (worth current multiplier). Shoot with Z to raise multiplier then shoot with X to increase score. Extra Shield and Life every 50000 points (to max of 3). Produced in a week or so, exploring 'spirograph' maths as bullet generation routines. The enemies also evolve over time, being more likely to use weapons that have successfully destroyed you already. This indie shmup was released on a PC Gamer UK cd in 2008.